I should probably start by saying that I am a life-long knitter. My passion for playing with two sticks and some string has been with me for as long as I can remember. In fact, I was crafting with yarn long before my grandmother ever taught me to knit. So it seems odd to me, in retrospect, that my deep and abiding love of all things yarn never made the jump to crochet. Perhaps it’s because there simply wasn’t a crocheter close at hand to steer me in that direction. At any rate, as time went on, I found that I was quite happy knitting away and gave very little thought to including crochet in my skill set. Since joining the team at WEBS, however, I have found that it just might be helpful to have some understanding of the crochet questions and conundrums that arise from time to time, and in order to do that, I should probably begin to acquire some functional knowledge of the craft. Don’t get me wrong, I’ve got the conceptual basics down, you know, things like: crochet projects require more yarn than knitting projects; recommending the proper hook size for a particular yarn; and making (very) basic estimates about gauge. Herein was the sum total of my understanding of crochet. Until now. Over the past month or two, I have begun a new adventure into the world of chains and half-double crochets, and find myself chomping at the bit to unravel such mysteries as pattern reading and crocheted lace. Fortunately, I am firmly committed to the notion of swatching as a means of acquiring skill, and I have created several lovely (and with mostly straight edges, I might add) single crochet swatches. 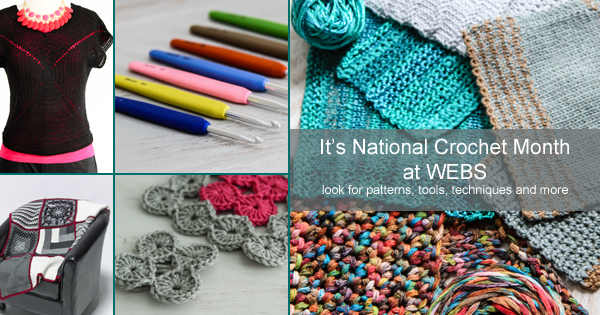 Feeling confident that it is time to expand my repertoire, I am celebrating National Crochet Month by incorporating a new stitch or two into my next few swatches and investigating our crochet class offerings here at WEBS. How lucky I am to spend my days in the company of truly accomplished crocheters who are happy to answer questions and take the time to help a newbie progress. Whenever I get stuck or make a mess (I even crocheted so tightly that I once broke my swatch – don’t ask), my co-workers patiently get me back on track and tell me how well I’m doing. Encouragement for which I am truly grateful. They point me in the direction of the instructional videos on our website, suggest wonderful tools of the trade (the Knitter’s Pride Dreamz hooks are my favorites so far), and some beautiful patterns to whet my appetite – Valley Yarns Crocus Lace Stole and Fluvial by ChickenBetty both have piqued my interest. They tell me the motion of the hook and my tension will begin to feel more comfortable soon, it just takes a bit of practice. I know they’re right, after all, I’ve said very similar words to many a burgeoning knitter. I just have to relax and and enjoy the process. The long winter has me itching to start new things, which is terrible for my WIP list, but great for discovering new (and new to me) patterns. Since March is National Crochet Month, I decided maybe I’d flex my crochet muscles and took a peek at what we have for crochet PDF patterns. I love PDF patterns for several reasons. They don’t clutter up my house, I can store them on my phone or iPad, so I have them right there with me, and I can make notes on the patterns with several of the PDF apps that are out there (and save my notes for future projects). Perusing our collection of PDF crochet patterns, I have encountered a small problem. I want to make every pattern I’ve looked at. I guess I haven’t been keeping up with our PDF patterns because, wow! There are some incredible patterns available. I’m a big fan of hats, because I’m often cold, and if you’re having a less than stellar hair day, you can always throw a hat on! Sweet Clementine by ChickenBetty (who happens to be our own Sara Delaney) is high on my to-crochet list. I have loads of Elsebeth Lavold Silky Wool in my stash, and already have two hats made from it, so I know it’s great for just this purpose. 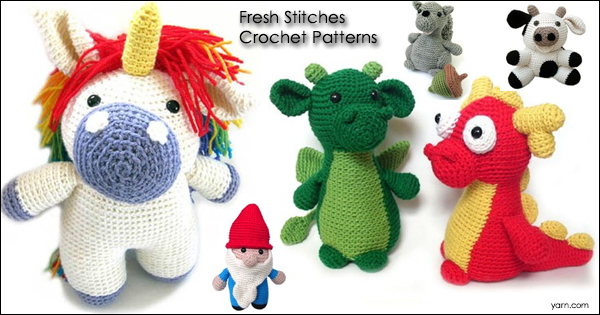 I want to crochet every single one of the adorable amigurumi patterns from Fresh Stitches by Stacy Trock. Flavia the Unicorn, Forrest the Gnome, Murray the Squirrel, Jackie the Cow, the Choose Your Own Adventure Dragon – I don’t know where to start! These are a great gift for your favorite child. One of my favorites (my godson) is turning two later this month, and he may be getting at least one of these as part of his gift. 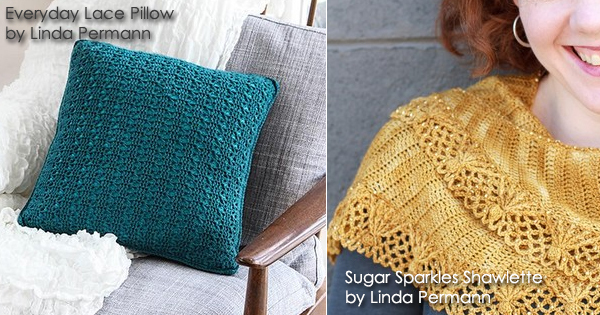 All the time I’ve been spending inside lately has made me want to make some changes around the house, and Linda Permann, in addition to having some spectacular garment and accessory patterns (we did a CAL with her Sugar Sparkles Shawlette), has a lovely pillow that I can picture on my couches. The Everyday Lace Pillow has a fabric cover underneath, and since I’ve also been dabbling in some sewing, this project will be a great way for me to combine that in. What PDF patterns do you want to download right now and start? We’re always excited when March rolls around and we have the added incentive to feature extra crochet content! While we do work to make sure that crochet is represented throughout the year it’s really nice to make it our focus for a month each year. 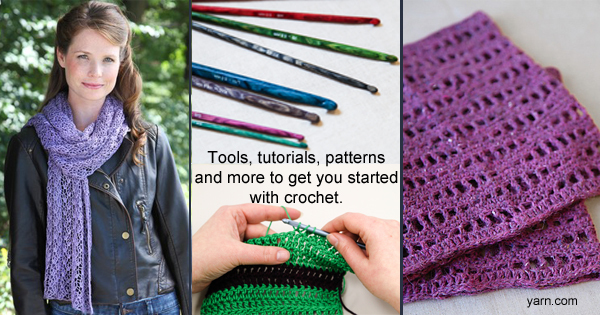 Be sure to check out the hundreds of crochet patterns available on our website, with almost 200 FREE crochet patterns there’s sure to be something for everybody. 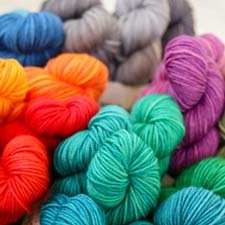 And if you’re able to visit our retail store this month be sure to check the yarn swatches for all our new yarns, there are knit and crochet swatches for each! 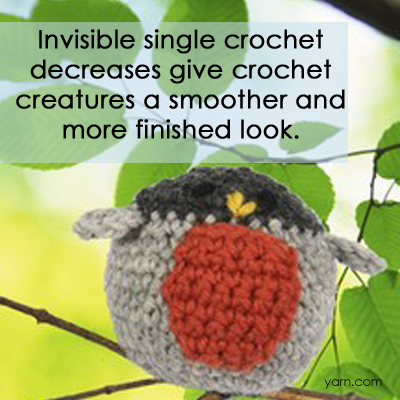 This week our focus is invisible single crochet decreases. This is a great way to decrease when you’re working in the round making stuffed animals or amigurumi. Most single crochet decreases leave you with a gap in the fabric on either side of the decreased stitch which can be really unsightly when that fabric is stuffed. This decrease keeps the same density of stitches to your fabric and is nearly invisible. This is a great stitch to use on our Valley Yarns Spring animals, the bunny, lamb and Robin! Try it out and let us know what you think. It’s National Crochet Month! To celebrate, we have some wonderful crochet tips to share with you. This week’s tip is from Sara, WEBS Marketing Coordinator and crochet designer. I like to use 2 linked stitch markers in different colors when my pattern asks me to increase every other round. When I start a round with increases, I’ll use the green marker. This tells me that when I come back to that marker I can Go-Go-Go! No reason to stop and think about the work; just one stitch in each stitch. When I do start that round with NO increases I’ll mark it with the orange one (better if it was red! ), this way when I get back around to that marker I know I need to STOP and make sure that I’m working my increases in this round. 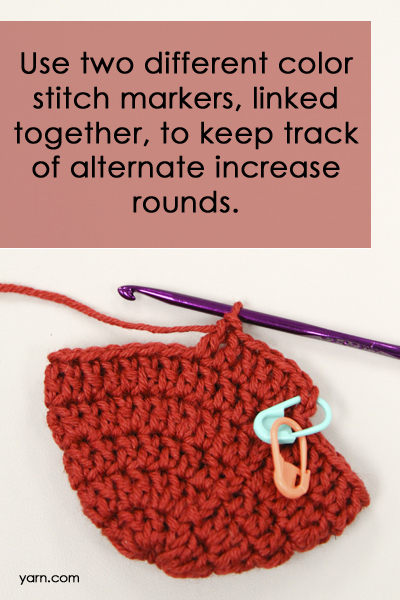 This is a great tip for both knitting and crochet! This week our focus is extended stitches. 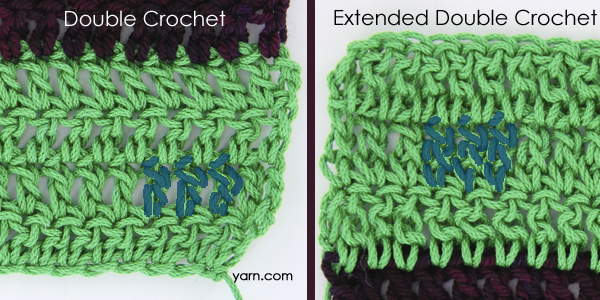 You can extend almost any crochet stitch with one simple step, when you have finished the set up for your stitch yarn over and pull through just one loop on your hook first, then finish the stitch as you normally would. To make an extended single crochet stitch: insert your hook into the next stitch, yarn over and bring up a loop, yarn over and pull through one loop, yarn over and pull through two loops. The right side of a few stitches have been highlighted above so you can see the difference in length. Extended single crochet still gives you the nice dense fabric that you usually get with single crochet but with a bit more movement and drape. And since the stitches are a bit taller the work goes quicker! This is a great stitch for crochet socks, like our Cosmos pattern! To make an extended half-double crochet stitch: yarn over, insert your hook into the next stitch, yarn over and bring up a loop, yarn over and pull through one loop, yarn over and pull through all three loops. 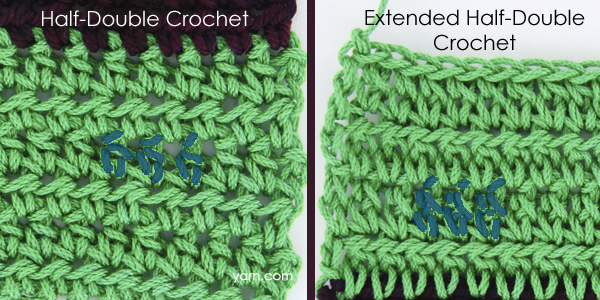 Extended half-double crochet gives you the height of double crochet stitches without being as open as double crochet. Again you can see the difference in length in the highlighted stitches. To make an extended double crochet stitch: yarn over, insert your hook into the next stitch, yarn over and bring up a loop, yarn over and pull through one loop, yarn over and pull through two loops, yarn over again and pull through two loops. Extended double crochet stitches give you the height of triples/trebles without being terribly leggy. You can see the difference in the highlighted stitches above. 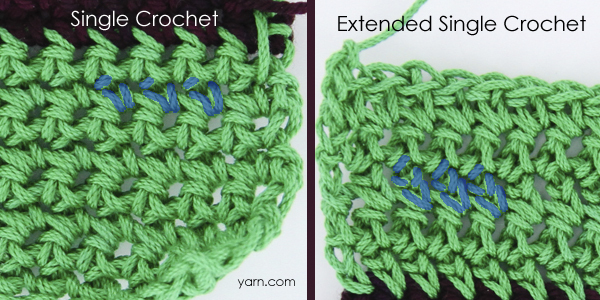 Have you ever used extended stitches? Arm Knitting has taken off like wildfire this year and there’s no reason why crocheters can’t get in on the action! Grab a few skeins of yarn and NO Hook and make yourself a scarf in less time than it takes to watch your favorite sitcom. This week our focus is Tunisian Crochet. This is an older technique that’s getting plenty of love lately. While there are lots of great pattern books out there now it can be hard to decide if it’s a new technique you’d enjoy. For a short piece like we’re practicing with today you can use a regular crochet hook but for anything larger than 10 stitches you’ll need a Tunisian or afghan hook. These typically look like straight knitting needles with a hook on the end instead of a point, or a version that looks like a regular crochet hook with a long cord on the back. This second type of Tunisian hook is also available in an interchangeable version with different length cords that you can attach to different hook sizes. Tunisian crochet begins like almost every other crochet project, with a foundation chain. In the samples here I’m working with a very short chain, just 9 chains long! Each completed row of stitches is made up of two rows of actions; the Forward Row puts loops on your hook and the Return Row works them off again. For the first Forward Row, insert your hook into the second chain from your hook and pull up a loop, leave this loop on your hook! Insert your hook into the next stitch and pull up a loop leaving it on your hook. Repeat this process for each chain stitch. Now that Your first Forward Row is done you should have 9 loops on your hook and you’re ready to begin the Return Row. 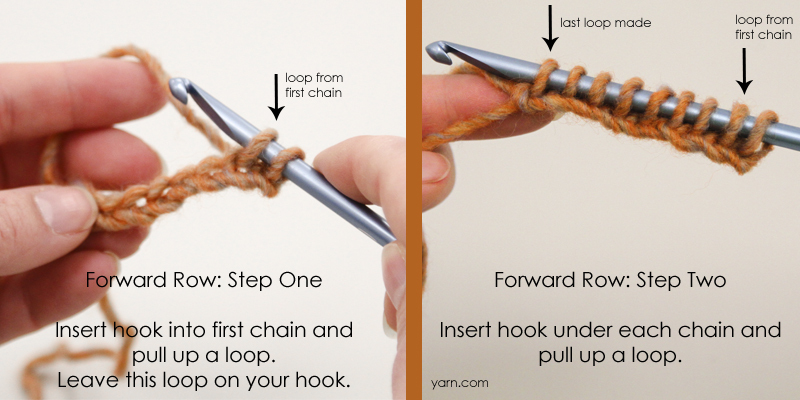 To start, yarn over and pull through just one loop on your hook. Yarn over again and pull through two loops. 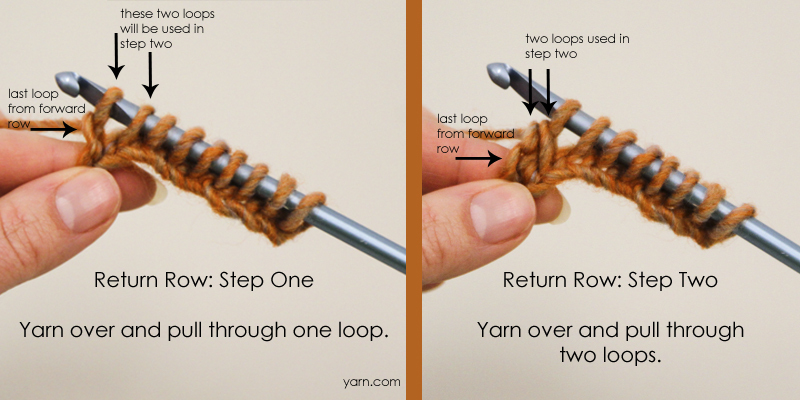 Repeat this step, yarning over and pulling through two loops, until you have worked all the way back to the beginning and only one loop remains on your hook. Your first full row of stitches in now complete! The Forward Row changes a bit now but your Return Rows will stay the same as what you’ve just done. 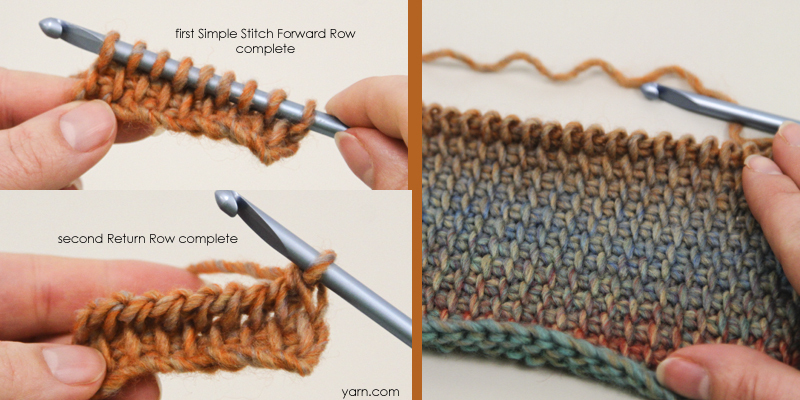 If you look at the row you’ve finished you’ll notice stitches that are straight up and down, these are called “vertical bars” and this is the part of the stitch that you’ll be using. 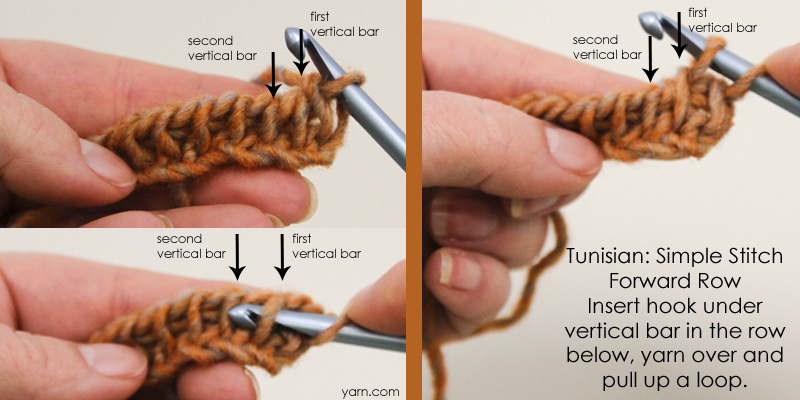 Insert your hook under the first vertical bar, yarn over and pull a loop back through that bar. Repeat that step, inserting your hook under the next bar, yarning over and pulling up a loop, until you have used all the vertical bars (the last one lives right on the edge of your work at the left hand side). Now you’ll repeat your Return Row, yarn over and pull through one loop first, then yarn over and pull through 2 loops at a time until you’re back to just one loop. Repeat those last two rows and you get a substantial fabric with great texture. Tunisian wants to curl in on itself so don’t be surprised by that! The larger your finished object the less curl there will be. And since Tunisian fabric is a bit more dense than regular crochet you’ll want to use a hook that is a size or two larger that what you might normally use. Swatching is a great way to try out new techniques and stitches but no one wants a basket or drawer full of little squares of crochet or knit fabric so what do you do with them? I like to make fingerless gloves, I use them all the time. For this pair I started with a chain of 25, and worked 25 rows of Tunisian Simple Stitch to for a square, and then seamed the edges, leaving a gap for the thumb. For the work pictured here I used Katia Azteca in color 7840 and a size J/10/6.00mm hook. If this technique appeals to you and you’re looking for more check out Tunisian Crochet by Sharon Hernes-Silverman, Get Hooked on Tunisian Crochet by Sheryl Thies or The New Tunisian Crochet – Dora Ohrenstein. This is a great instant-gratification project! 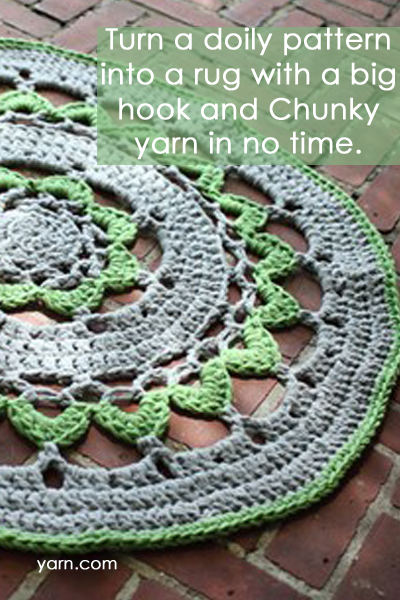 Take your favorite doily pattern and work it up using a chunky yarn and a big hook. We did something similar with our Hellebore Rug which was crocheted using 2 strands of Northampton Bulky, but if you’re looking for something washable try Katia Big Ribbon or Schachenmayr’s Bravo Big or Filaria. 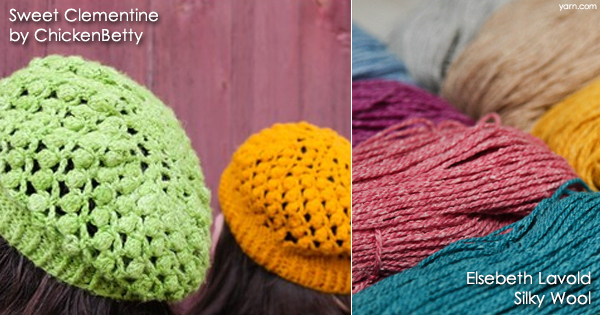 This week we’re focusing on Surface Crochet. 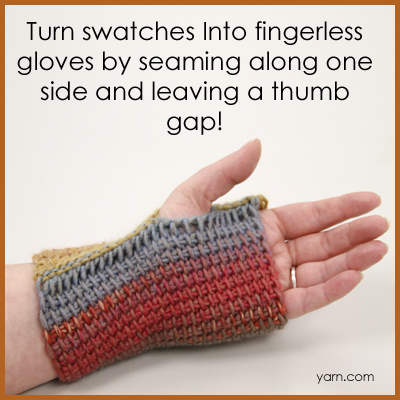 This is a great technique to use with both knit and crochet fabrics. 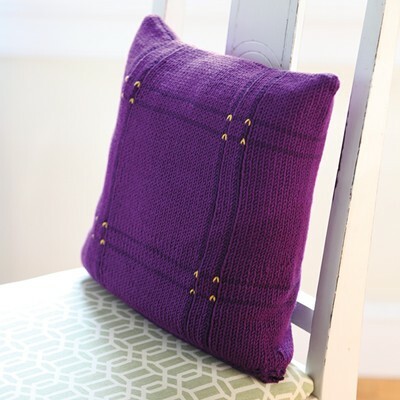 In its simplest form it’s a chain of slip stitches that appears on the surface of your fabric. It can be used for simple stripes or for more complex and free-form shapes. This video shows you how the technique can also be used to create unique shapes, allowing you to draw on the surface of your project and it’s easy to accomplish. 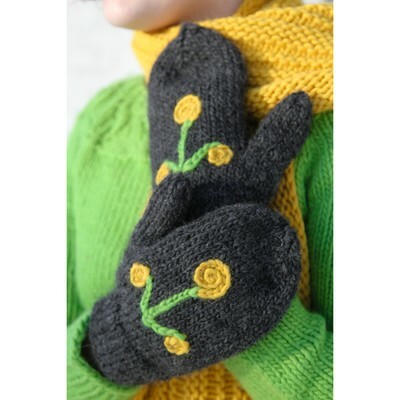 The Sprig Mittens are adorned with whimsical flowers but with surface crochet you could add almost any image. The Nordic Tiles scarf features floating squares that are joined by simple lines of surface crochet along 2 edges and through the center. Have you ever tried surface crochet?